“Birch” is Tod Jones. Born in 1961 in southern California, he moved to the east coast in 1993 in order to study for his Ph.D. at the University of Maryland, College Park. Afterwards, for twenty years, he taught English composition and literature at UMCP. For the past couple of years he has been working at L. L. Bean in Virginia. “Maple” is Karen, a 50+ year-old woman with the hiking ambition of a 30+ year-old. She grew up in Minnesota, where her family went camping and boating almost every summer weekend. Professionally, she works in higher education administration at American University. In her free time she plays the flute and paints with watercolors. Maple and Birth began hiking in 2014, starting out at nearby state parks. We have since made several backpacking trips to Grand Canyon National Park, and have backpacked at Grand Teton NP, as well. 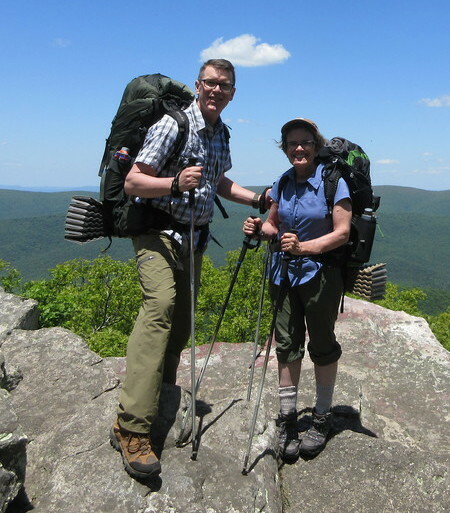 However, our obsession is to hike and backpack as much of the Appalachian Trail as time and our bodies will allow. We are hopeful that we will one day complete the AT. Time will tell. This blog tells the story of our adventures.